Agelyss Lash & Brow Enhancer - Does This Product Work? Grow beautifully long eyelashes and thicker, fuller eyebrows, by prolonging their natural growth cycles. Formulated with 5 clinically-proven, patented and trademarked active ingredients Agelyss™ Lash & Brow Enhancer extends the active phase of the hair's natural growth cycle in order to stimulate longer, fuller, thicker and stronger lashes and brows. By combating the aging process and protecting against harsh environmental conditions, brittle hair transforms into healthy hair. Revitalize and nourish with Agelyss™ Lash & Brow Enhancer for youthful brows and luscious, glossy lashes. Water, Propylene Glycol, Glycerin, Panthenol, Biotinoyl Tripeptide-1, Xanthan Gum, Sclerocarya Birrea, Seed Oil, Pisum Sativum (Pea) Sprout Extract, Wheat Amino Acids, Saccharide Isomerate, Soy Amino Acids, Arginine HCl, Ubiquinone, Serine, Threonine, Resveratrol, Phenoxyethanol, Sodium Benzoate, Squalane, Polysorbate 80, Citric Acid, Sodium Citrate, Iodopropynyl Butylcarbamate, Potassium Sorbate, Tocopheryl Acetate (Vitamin E), Diazolidinyl Urea, Tetrasodium EDTA. LASHES: Using the applicator, apply along the root of the upper lash line, just like with eyeliner. For best results, apply each night after cleansing. BROWS: Using the applicator, apply along the root of the brow and sweep along the entire eyebrow. For best results, apply each night after cleansing. How does Agelyss™ Lash & Brow Enhancer work? Agelyss™ Lash & Brow Enhancer works on many levels. It conditions, nourishes, lengthens, volumizes, strengthens and thickens eyelashes naturally and prevents premature breakage. It also stimulates eyelash and eyebrow growth via collagen synthesis. For best results, we suggest daily use. Apply 30 minutes before going to bed. Is Agelyss™ Lash & Brow Enhancer only for women? No, Agelyss™ Lash & Brow Enhancer is made for both men and women, and works equally well for either gender. Can you use Agelyss™ Lash & Brow Enhancer with eyelash extensions? Yes you can! Agelyss™ Lash & Brow Enhancer is especially formulated with a blend of clinically-tested and nourishing ingredients that will continue to condition your natural lashes while you have eyelash extensions. How long will a tube last me? This depends on how you use the product. If you follow the instructions correctly, each tube is designed to last approximately one month. Agelyss™ skin/beauty care products are formulated without parabens, hormones, phthalates, synthetic dyes, petrochemicals or animal by-products. None of our products contain artificial fragrances. We use only 100% pure natural steam distilled/cold-pressed essential oils. All our products come in airtight sealed containers/tubes to ensure freshness and maintain the integrity of the formulas. Our serums come in hermetically sealed pumps to combat contaminants that may jeopardize the quality of the products. Yes. We do not test any of our products on animals. We are committed to creating cruelty-free skin/beauty care products that do not harm animals or the environment in any way. All of our products are formulated without any animal by-products and are vegan friendly. "I love the look of long lashe but I don't have the patience for false eyelashes which is why this product is so dope! Literally changing my life. You guys rock." "I have sensitive eyes so I'm always worried about eye creams and serums. Luckily, this enhancer has been great! No irritations or problems whatsoever which means I can enjoy my new lashes worry-free." "As with all great beauty products, I took this one from my mom's makeup case. I knew I would have to order her a new one because there was no way I was giving it back!" "Treatments caused my eyebrows to fall out and left me looking like a sick person, which I really hated. Growing them back has given me a part of myself back that I appreciate so much. Thank you, Agelyss!" "I've used many different lash products over the years and I'm sticking with this one! I am telling all my friends to try it because I know once they do, they'll be as obsessed as I am." "I have used this awesme product for both my lashes and brows and can testify that it works so well. The wand has the perfect amount of product when you pull it out of the tube, there's no clumping and it glides right on. " "BEST enhancer for lashes ever! My lash technician said she couldn't tell I had some on. She said typically people that use this type of product come in and their lashes are goopy but mine were clean! Love it!" "For years I have been buying other brands of volumizers that I've been less than impressed with. They clump and end up flaking off all over. But this lash enhancer is hands down my top pick! It glides on amazingly." "This product is an absolute gem! My whole face has opened up simply by changing my eyebrows and eyelashes. I couldn't have imagined one product could make such a difference." "Love this product! It goes on smoothly and it is long lasting. I didn't have to keep re-applying it all the time like other products I have used before. Highly recommend it." "My niece has been documenting my eyelash and eyebrow growth on her instagram page. The amazing thing we noticed is that not only are the hairs longer but they are darker and thicker too. It's unbelievable!" "Applying this enhancer is the same as applying eyeliner. It also comes off easily and is extremely gentle. At first I was worried to put it so close to my eyes but once I saw the results I freaked out from joy! Love it!" "My close friends and I always tell each other when we find a great beauty product. Well, this has made the rounds with all of us! It is spectacular and really works." "What attracted me to this product was the return policy; I was definitely skeptical about it really working. So, I was seriously blown away by the results! Not only do I see a difference, but all my friends do as well." "This product has a very light silky feel to it, which is great. I tried other products that were chalky to apply and hard to remove. My lashes look fabulous. This product is a star!" "I started using this Lash & Brow Enhancer about a month ago. It has shifted the focus of my face to my eyes and I hardly need to use mascara anymore. Thank you so much, I'm so happy!" "I cannot believe how affordable this is compared with the products I used to buy! I am so done spending tons of money on cheap ingredients. I am spreading the word so that this company never goes out of business!" 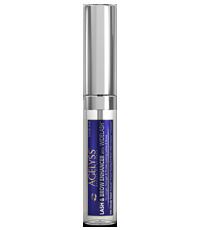 "I love this Agelyss lash serum. I usually go to a department store for beauty products but I'm really glad I bought this online and tested this out. This is now my favorite eye product. " "I am so happy with this product. It met my expectations. It feels lightweight and it separates my lashes while lengthening them. No flaking or smudging once it dries. Also better priced than some other brands I've tried." "I ruined my lashes by using a cheap drugstore mascara. It clumped them together and many fell out. It was devastating. After trying this product, I am beyond relieved that now my eyelashes have grown back!" "I am very pleased with this item. My experience has been great. It did not turn gooey or clumpy like other products that I've purchased at the department store's cosmetic counter. " "Having tried the Lash & Brow Enhancer for both my brows and lashes, I can say that this product is PERFECT! It helps to increase the volume and thickness. Will definitely buy again. Highly recommend!" "I have tried so many cosmetic brands that I can suss out which are the trustworthy ones. Therefore it came as no surprise that this actually works. I'm looking forward to trying more of their skincare line." "In my 20's, my lashes used to be so much longer and thicker. I needed to do something to try and get them back. After a couple of weeks, I was so happy to see my lashes back! Great product, great results." "All my eyelashes broke off after I used extensions for my wedding and I had little stubby lashes for 3 months. It was a nightmare. I then bought this eyelash product from Agelyss which helped me get my lashes back." "My eyebrows have been needing some assistance from my eyebrow pencil for some time now. It's truly amazing that after using this product, I don't need my makeup anymore! 5 stars!!" "Literally the best lash volumizer ever! Absolutely love it. My eyelashes and brows used to be very sparse. Since I started using this product, I have seen a drastic improvement of longer and thicker hair growth." "Before I tried this, no one had ever once commented on my eyelashes. Now, all of a sudden, people can't stop commenting about how great they look. My eyes really pop as well, it's fantastic!" "My eyelashes are very fragile and tend to break easily. I kept my expectations low with this product and I was so surprised and happy by how well it worked! For the first time, I have long eyelashes and I love it!! " "My eyes never looked so good!! I applied this Lash Enhancer to my wimpy lashes and now they are gorgeous!! I am so happy with this product." Are You Tired Of Beauty Products That Just Don't Work? There are literally hundreds of skin care/beauty manufacturers online all claiming to have the best products. But how do you know who to trust? And more importantly, how do you know which Eyelash and Brow Volumizer is actually going to work for you? With all of the products out there, you want to make sure you get the highest quality Eyelash and Brow Volumizer available, period. Agelyss™ was created to help you find the best possible skin care and beauty products on the market, based on extensive research. 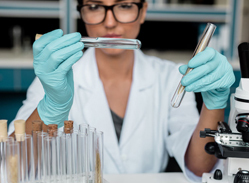 Our team, at Agelyss™, concentrates on the clinical data and actual science to make sure you get the most effective Eyelash and Brow Volumizer on the market, hands down. We will guide you through our process of what to look for and what to stay away from. At the end of this page you will have a firm understanding of which Eyelash and Brow Volumizer is going to help you and why. Hundreds of companies and marketers have already jumped on the beauty products bandwagon to try and create their own version of an Eyelash and Brow Volumizer. Most of them disregard the research and put together inferior products to try and cash in on the latest skin care, health and beauty trends. Most Eyelash and Brow Volumizer don't work to enhance and lengthen lashes and brows as they only contain 1 active ingredient, 2 if you're lucky. These products are watered down with about 98% inactive ingredients. We urge you to look into any Eyelash and Brow Volumizer you buy to verify what their active ingredients are. At the end of the day, you want a product that will work for you. You want ingredients with a clinical study to backup their claims. And you want a product that will do what it says it will. There are literally hundreds of Eyelash and Brow Volumizers online all claiming to have the best product. But how do you know who to trust? And more importantly, how do you know which product is actually going to work for you? With all of the products out there, you want to make sure you get the highest quality product available, period. How Do You Find An Eyelash and Brow Volumizer That Will Actually Work? We understand that your end goal is to lengthen and thicken your lashes and brows to beautify and maintain a youthful appearance. Plain and simple. And you want the best Eyelash and Brow Volumizer to help you do that. You don&apos;t want to waste your time or money on something that won&apos;t work. So, how do you find an Eyelash and Brow Volumizer that will actually help you achieve the appearance that you&apos;re looking for? In the majority of skin/beauty care formulas on the market today, most contain a range of ingredients - some known as active and others, inactive. The active ingredients are the ones that are going to get you the quality results that you are looking for. Many brands, including the very well known brands, use a weak concentration of active ingredients - the industry standard being around 1-2%. In addition, don't be so sure that those active ingredients are actually clinically-proven. At Agelyss™ we understand that the active ingredients are what make the product work. That's why Agelyss™ Lash & Brow Enhancer uses a potent concentration of 10% clinically-proven active ingredients. This is unheard of in the skin care industry. Why? Because many companies are led by cost issues and not research. Most skin/beauty care companies are driven by cost, even the well known, big ones. It's costly to include 10% clinically-proven active ingredients, which is why most products only contain 1-2%. So, be on the lookout for what percentage of clinically-proven active ingredients can be found in your products. While the percentage of active ingredients is very important, the variety is also just as important. Why? Well, each ingredient serves a different purpose, and when combined, will get you the results that you're looking for. You would need to apply 5-7 different Eyelash and Brow Volumizers to get the same effect as the Agelyss™ Lash & Brow Enhancer due to the different types of active ingredients it contains. If you look at most Eyelash and Brow Volumizers out there, you'll notice that they have maybe 1 or 2 active ingredients. Some are clinically-proven, others are not. While often 1 active ingredient could be very strong and effective for a certain issue, it is usually not the perfect solution as a total care, all encompassing Eyelash and Brow Volumizer. The Agelyss™ Lash & Brow Enhancer contains not 1 or 2 clinically-proven ingredients, but 5 patented and trademarked clinically-proven ingredients. Each active ingredient serves a purpose to create the perfect Eyelash and Brow Volumizer that will deliver top class results. No other product on the market comes close. 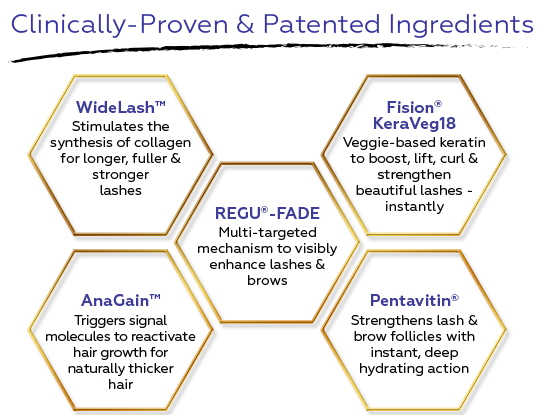 Agelyss™ Lash & Brow Enhancer contains, not 1 or 2 active ingredients like other brands, but 5 patented and trademarked clinically-proven active ingredients. Lengthens and strengthens lashes and brows by stimulating hair growth and anchoring them securely to their roots. For naturally fuller, thicker and more conditioned luscious lashes. A vegetable-based substitute for animal keratin, which naturally mimics the proteins responsible for hair strength and elasticity. Protects and enhances hair for healthy, shiny and beautiful lashes and brows. A nature-identical trans-resveratrol, REGU®-FADE is a powerful antioxidant which is free of pesticides and preservatives. Resveratrol is produced by plants and has been studied for its potent anti-aging qualities via promoting collagen synthesis. Based on organic pea sprouts, AnaGain™ naturally reactivates hair growth by stimulating signal molecules at the hair root. Revives brittle hair and restores shine. Transform hair to be fuller, denser and thicker. If you're looking for the highest quality skin care/beauty products available, turn to Agelyss™ first instead of wasting your time on inferior products. Agelyss™ is the best choice for quality and comes with a risk free 365-Day 100% Money Back Guarantee. Not only do we welcome you in and encourage you to read through our research and information, we invite and welcome any questions you may have. You can email or call us at any time. We are here to help you and to provide you with superior products that will help you achieve your personal skin/beauty care goals. If any Eyelash and Brow Volumizer is going to work for you, this is it. If you're serious about the health of your lashes and brows and stopping them from breaking or falling out, then you should try a product that is serious about helping you achieve your goals. We did extensive research to ensure that we found the best Eyelash and Brow Volumizer on the market and are so confident that it&apos;s going to work for you, that we&apos;re offering you a full year to try it out. The expert research and formulation team at Agelyss™ work tirelessly to ensure that we remain the market leaders in re-defining skin/beauty care technology. And it shows! Our products are lush, creamy, easy to apply and smell divine. We know that you will enjoy using our products and will be thrilled with the results. So, if you are looking for innovative skin/beauty care products that are formulated to the highest standards to enhance your skin’s natural beauty, help grow your lashes and brows and slow down the signs of aging, then you have found the best resource possible for achieving beautiful looking lashes and brows - effortlessly. We promise you - they never looked so good! Avoid Products With A Low Percentage Of Active Ingredients. - An effective, superior quality skin/beauty care product will contain a high percentage of trademarked, patented, clinically-proven ingredients, meaning that they have been tested and shown to be effective. All Agelyss™ products contain up to 10% active ingredients, which are trademarked, patented and backed by clinical research. Avoid Unhelpful, Dangerous Or Weak Blends. - If you’re looking for a high quality skin/beauty care product, make sure there are no added ingredients that might lower the quality. Avoid products that contain synthetic fragrances, parabens, hormones and phthalates that may cause long-term damage or dryness. Avoid Products Tested On Animals. - The truth is, that in today's scientifically advanced world, there is no need to test on animals anymore and many companies have boycotted this approach. Skin/beauty care manufacturers do not need to abuse or torture animals in order to test the effectiveness of key ingredients. All Agelyss™ products are animal and vegan friendly. Check The Seal. - Make sure that the product is hygienically sealed and comes in a hermetically sealed airtight tube. This is essential to protect it from harmful external elements, as well as, to ensure the stability and freshness of the ingredients to optimize effectiveness. Why Does Agelyss™ Have The #1 Eyelash and Brow Volumizer? Agelyss™ innovative skin/beauty care treatments are designed to protect against breakage and environmental elements, extend, lengthen and thicken lashes and brows, restore hair health and are available through our online website or via Amazon. Agelyss™ Lash & Brow Enhancer meets all of the criteria listed above. It’s the highest quality Eyelash and Brow Volumizer of its kind available on the market and, it works. Agelyss™ products are formulated using an unparalleled strength of active ingredients - 10% active ingredients (similar products only contain 2%) PLUS, they contain at least 5 proven ingredients that are patented and trademarked and backed by clinical studies. Agelyss™ creams and serums not only meet all of the criteria of a top quality, effective skin care product - they exceed them! Which Eyelash and Brow Volumizer Should You Buy? For instant thickening effects and long-term lengthening benefits for your lashes and brows, Agelyss™ Lash & Brow Enhancer is the answer. This Eyelash and Brow Volumizer meets all of the above criteria (and more) and is guaranteed to work - or your money back! Why take chances when it comes to the health of your lashes and brows? You deserve the best, so choose the best.